As the name might suggest, Hi Fi is a music-centric, retro haunt with a full menu served late into the night, and a cocktail and adult milkshake menu to match. The contemporary structure juxtaposes rock n’ roll art and accents with advanced audio/visual components all against a modern, yet rustic foundation. 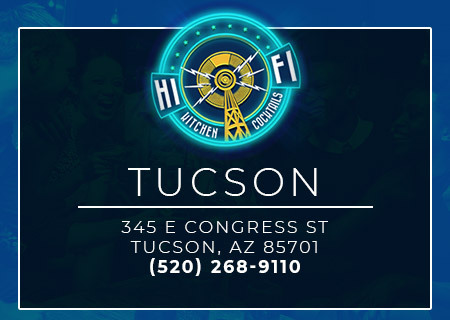 Hi Fi is a fully indoor/outdoor space, separated by glass garage doors, that features a 360-degree island bar, an elevated lounge-style seating area, plus two community tables, outdoor hightops and resort-style lounge furniture. Two centerpiece design features dominate the visuals: A vintage speaker wall erected with wood-framed speakers and throwback black and white televisions. Following up that act is the showstopper: a 45-foot digital graffiti wall that projects an ever-evolving array of 3D images to morph the mood throughout the night. 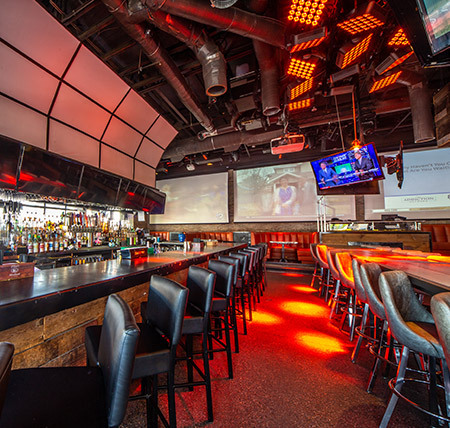 The venue also offers three 15’ projector screens and 35 additional HDTV monitors with branding and presentation capabilities. Hi Fi’s menu focuses on amped-up American classics with uniquely sweet accompaniments. Our specialty: more than a dozen varieties of custom ice cream milkshakes, each available in the adult milkshake form with a boozy component, making for a whimsical addition to your next event. 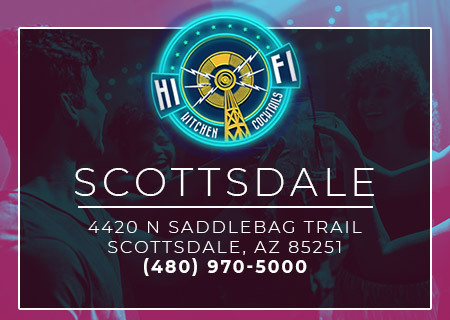 Both of our Arizona restaurants in Scottsdale and Tucson are available for both partial and full buy-outs with custom group catering, beverage, entertainment and decor packages available. Book your next private or corporate event at an EEG venue and experience a departure from traditional event arrangements. With more than 25 years of experience, Evening Entertainment Group has pioneered the Scottsdale nightlife scene and successfully redefined the art of event planning. EEG’s seven concepts – Sandbar Mexican Grill, Hi Fi Kitchen & Cocktails, Bevvy Gastropub, Bottled Blonde Pizzeria + Beer Garden, Livewire, RnR Gastropub and The Mint Ultra Lounge – are undeniably the Valley’s most uniquely exclusive event destinations. Each EEG venue features a distinct ambiance conducted by advanced lighting systems, state-of-the-art sound installations, custom architecture, chic design elements and exquisite cuisine. With every venue brilliantly crafted to support the finest in events, entertainment and dining, EEG’s signature elements unite sophistication and stimulation within each space. EEG is renowned for maintaining the highest standards in cuisine, inspired drinks and creative atmospheres within our swanky lounges, entertainment venues and neighborhood dining hubs. We assure each venue maintains the same air of refinement, while simultaneously exuding individuality in concept and character.